Ray Vetsch was born and grew up in Switzerland. He started flying gliders in the Alps at the age of 16. Ray Vetsch flew everything he could get his hands on from skydiving, hand gliding to crop dusters and put himself through medical school by flying tourist through the Alps. 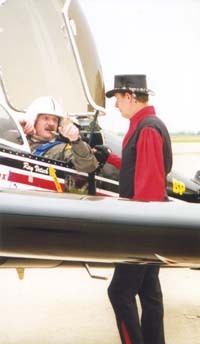 The incredible Eric Miller, multiple European champ put Ray on the right tract of aerobatics flying. Initially flying Citabria the super-decathlon, then moving up to the Pitts S2B. Ray entered the air show circuit with Wayne Handley's Pitts S1S and then moved up to the incredible SUKHOI. He flew them all but he has concluded that the SUKHOI is the toughest, most demanding, but also the best and most fun aircraft he ever sat in. Vetsch is involved in youth programs, ROTC, and schools to motivate our children to stay in school and remain drug free. Dr. Vetsch is a Pediatric and Adult Heart Surgeon who works for Freeman Heart Hospital in Joplin, Missouri servicing the 4-State area. Jimmy Franklin and Ray Vetsch. All Fixed Up and Ready to Go With a new engine on his airplane and a new valve in his heart, Jim Franklin is anxious to show air show audiences the "improvements" he’s made this past year. In early 1998, Air Shows reported the rumor that Franklin was planning to strap a J-85 jet engine to the belly of his Waco Mystery Ship. The rumor turned out to be true, but Franklin’s plans were sidelined by a heart problem that required complex valve repair surgery. "Basically, they used my pulmonary valve to replace a bad aortic valve and replaced the pulmonary valve with a donor aortic valve." 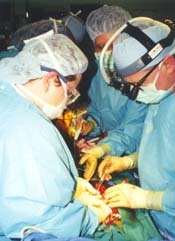 The surgery was performed by Dr. Ray Vetsch, one of the only five surgeons Franklin knows of that will even undertake the procedure. 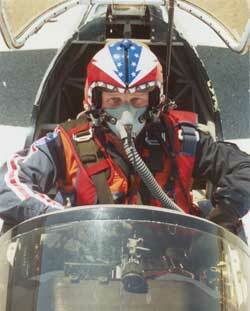 Best of all, Vetsch is an ICAS member and air show performer himself. "It was great to have known him before hand," said Franklin. "It made a very serious operation easy for me. I was really comfortable with his expertise in this particular procedure." This particular procedure, said Vetsch, assures Franklin a "durable result" that makes him unlimited physically. Other options would have required re-operation down the road or medicines that would have excluded him from flying aerobatics. "It was the procedure they tried on [Arnold] Schwartznegger, but it failed and resulted in a second operation," said Vetsch. The procedure is commonly done in athletes or those doing strenuous work who are out of range of continues care, he explained. Vetsch has been part of the air show community for about five years, flying his Sukhoi 26 MX in "as many air shows as he can get." When he was twelve years old, a pilot inspired him to achieve and he is committed to imprinting other youngsters with the same motivation. He visits schools to talk with students about the physics of flight and encourages them to stay in the educational process. "If you do, you can become anything, pilot, heart surgeon, whatever." Franklin, now recovered and back to work at his new home in Neosho, Missouri, is getting ready to test his new souped-up Waco in November. First, he says, he’ll take it up with just the radial engine to see how it runs with the new jet engine as installed. Then he’ll let the jet idle and bit by bit take it up to full power. I’ve had the idea since 1978. When I started my Zar program in 1981, the jet Waco was going to be Zar’s ship, but I just never got around to it. Now the time is right." The J-85, in combination with the Waco’s R-985 Junior Wasp radial engine will allow Franklin to grab altitude in seconds instead of minutes and maintain a higher average speed through maneuvers. "It’s not speed I’m after," said Franklin. "It’s performance. I’m going 200 mpg now, I’ll be going about 180 mpg with the two engines. I won’t need the momentum of speed anymore. The momentum is in the throttle." Les Shockley and his son Kenny actually performed the installation of the J-85. One of the problems with biplanes, Franklin explains, is that at places like Reno and Colorado the high density altitude kills performance. With this installation, high density is no longer a problem. Franklin emphasizes that increased safety factor of adding the J-85. "You’re now running a twin engine, even if one is on the nose and the other on the belly. There’s no need to worry about engine failure when you’re over water."